Earth to investors: Don't panic! Investors can't seem to get relief from the summer heat. 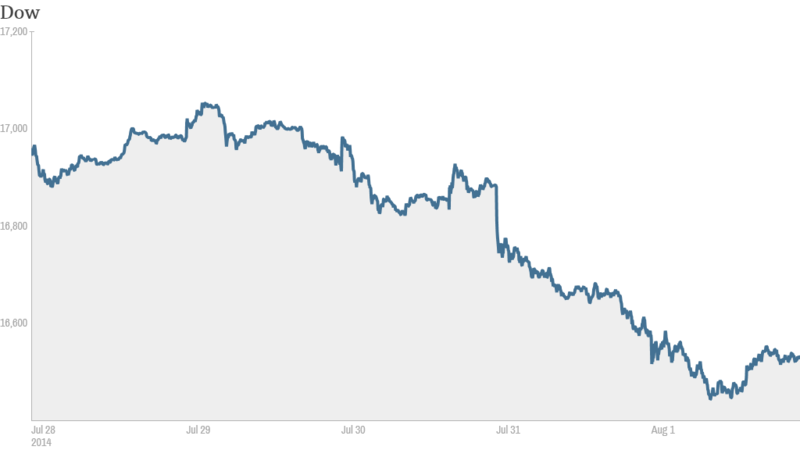 The Dow fell 70 points Friday on what turned out to be a volatile day of trading. The blue chip index finished the week lower and is now down for the year following Thursday's 317-point drop. The S&P 500 and Nasdaq also slipped Friday. The S&P 500 dropped nearly 3 %this week, and the Nasdaq lost more than 2%. Still, both indexes are up over 4% for 2014. Jobs, jobs, jobs: Employers added 209,000 jobs in July. That was well shy of the 288,000 jobs that were created in June and below the gain of 230,000 jobs predicted by economists polled by CNNMoney . The weaker-than-expected jobs report could ease fears on Wall Street that the Federal Reserve will hike interest rates early next year. The government said the unemployment rate ticked up to 6.2% from 6.1%. "The employment data was not too hot, not too cold. It was just about right in terms of what a skittish market was looking for," said Dave Donabedian, chief investment officer at Atlantic Trust, which manages about $25 billion in assets. In other economic news, a new ISM report showed U.S. manufacturing activity shifted into a higher gear in July. However, a separate report revealed consumer sentiment dipped in July to the lowest level since March. 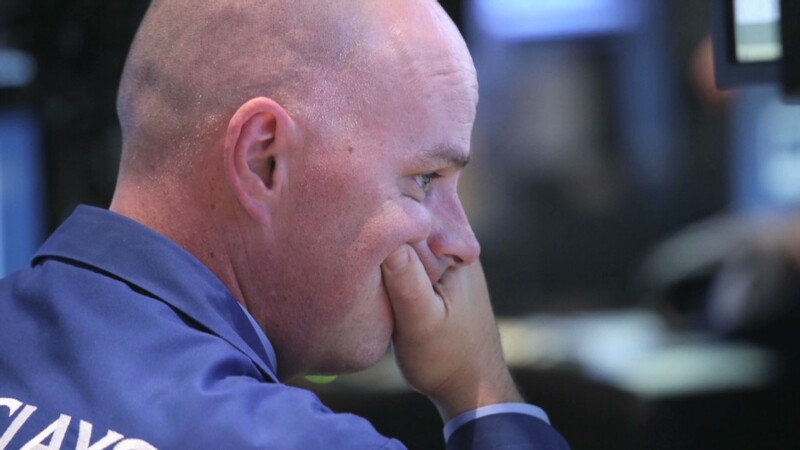 World markets slide: European markets fell, following the lead of the U.S on Thursday. Germany's Dax tumbled on concerns about the impact of escalating tensions with Russia on the region's fragile economy. The EU turned up the heat on Moscow Thursday by including Russia's biggest bank, Sberbank, on its list of sanctions targets. Societe Generale (SCGLF) dropped 2% after the French bank's second quarter earnings showed business in Russia is suffering. It joins a chorus of Western companies facing problems in Russia. "There has been large, insistent selling of stocks out of Europe," said Michael Block, chief strategist at Rhino Trading Partners, in a note to clients. Big movers -- GoPro, LinkedIn, Iliad: GoPro's (GPRO) debut earnings report failed to impress Wall Street's extreme expectations, driving the gadget maker's stock down 15%. Iliad (ILIAY) dropped 7% in Europe after the French telecom firm made a surprise $15 billion takeover bid for T-Mobile USA (TMUS). On the other hand, shares of LinkedIn (LNKD) popped 12% after the social media company posted better-than-expected quarterly results. Expedia (EXPE) traveled 6% higher on upbeat earnings and a 29% jump in bookings. Tesla (TSLA) also drove 4% higher ding after Elon Musk's electric car maker reported strong sales and a profit that topped forecasts. Bally Technologies (BYI) hit the jackpot as Scientific Games (SGMS) agreed to acquire the slot machine maker for $3.3 billion. Bally spiked 30% on the buyout, which also sent Scientific Games climbing 3%. Procter & Gamble (PG) rallied about 3% after posting a solid earnings beat despite shrinking sales. Investors largely overlooked the consumer products giant's tepid outlook for the year. Other big-name companies also reported earnings, including Clorox (CLX) and Chevron (CVX).